Insufficient scalability and bad resource management of software services can easily consume any potential savings from cloud deployment. Failed service-level agreements (SLAs) cause penalties for the provider, while oversized SLAs waste resources on the customer’s side. IBM Systems Sciences Institute estimates that a defect which costs one unit to fix in design, costs 15 units to fix in testing (system/acceptance) and 100 units or more to fix in production ; this cost estimation does not even consider the impact cost due to, for example, delayed time to market, lost revenue, lost customers, and bad public relations. Deployment on the cloud gives software designers far reaching control over the resource parameters of the execution environment, such as the number and kind of processors, the amount of memory and storage capacity, and the bandwidth. In this context, designers can also control their software’s trade-offs between the incurred cost and the delivered quality-of-service. SLA-aware services, which are designed for scalability, can even change these parameters dynamically, at runtime, to meet their service contracts. The formally defined Abstract Behavioral Specification language ABS  realizes a separation of concerns between the cost of execution and the capacity of dynamically provisioned cloud resources . Models are executable; a simulation tool for ABS supports rapid prototyping and visualization. The use of languages such as ABS enables developers to shift deployment decisions from late in the software engineering process to become an integral part of software design . ABS permits to design and validate these services by connecting executable models to quality of service requirements, using a Cloud API to interface with an abstraction of the cloud provisioning. The modeling approach and analyses developed for ABS have been successfully applied in an industrial context to SDL Fredhopper’s eCommerce Optimization  and to Apache’s Hadoop YARN . In this paper, we illustrate the use of ABS to make deployment decisions at the modeling level for a so-called hot pool : a local scaling point in a service with a load balancer distributing jobs to workers. Hot pools were originally introduced for resilience, but represent a viable approach for fine-grained scaling of services on the cloud. We model different deployment scenarios for the hot pool, varying in the numbers of workers, and show how to model a simple autoscaler for the hot pool. We use simulations to compare performance and resource usage for the hot pool using different deployment scenarios. We refer to [1, 12] for related work on the ABS modeling language. The functional layer of ABS is used to model computations on the internal data of objects. It allows designers to abstract from the implementation details of imperative data structures at an early stage in the software design. The functional layer combines a language for parametric algebraic data types (ADTs) and a simple functional language with case distinction and pattern matching. ABS includes a library with predefined datatypes such as Bool, Int, String, Rat, Unit, etc. It also has parametric datatypes such as lists, sets and maps. All other types and functions are user-defined. The imperative layer of ABS allows designers to express communication and synchronization between concurrent objects. In the imperative layer, processes are encapsulated within COGs [9, 15], the processes are created automatically at method call reception and terminated after the method call execution is finished. ABS combines active (with a run method which is automatically activated) and reactive behavior of objects. ABS is based on cooperative scheduling: Inside COGs processes may suspend at explicitly defined scheduling points, at which point control may be transferred to another process. Suspension allows other pending processes to be activated. However, the suspending process does not signal any particular process, instead the selection of the new process is left to the scheduler. In between these explicit scheduling points, only one process is active inside a COG, which means that race conditions are avoided. Real Time ABS  extends ABS with support for the modeling and manipulation of dense time. This extension allows to represent execution time inside methods. The local passage of time is expressed in terms of a statement called duration (as in, e.g., UPPAAL ). To express dense time, we consider a model represented by two types Time and Duration. Time values capture points in time as reflected on a global clock during execution. In contrast, finite durations reflect the passage of time. The ABS Cloud API provides an interface to model cloud infrastructure in ABS . The ABS Cloud API supports the dynamic acquisition and release of virtual machines with resources. Virtual machines in ABS are modeled using deployment components . A deployment component is a modeling abstraction which captures locations offering resources to computations. The language also supports cost annotations to model resource consumption. The combination of deployment components with resource computations and cost annotations allows modeling implicit passage of time. In this case, time can be observed by measuring the executing model, and monitoring the response time of a system. In this paper we will model so-called elastic computing resources, where the computation speed of virtual machines is determined by the amount of elastic computing resources allocated to these machines per discrete time interval (referred as time interval in the rest of the paper). The ABS Cloud API includes methods for launching and shutting down virtual machines. In the implementation, this is done by creating deployment components on which an application manager can deploy objects. In addition, the ABS Cloud API keeps track of the accumulated costs incurred by job execution on the cloud. ABS is supported by a range of analysis tools (see, e.g., ); for the analysis results in this paper, we are using the simulation tool which generates Erlang code. Let us consider an example which models a service that executes heavy and parallel computations on the cloud. Figure 1 depicts such an architecture. In this architecture, clients, which want to access the service, call a service endpoint. The service endpoint communicates with a load balancer to get workers that will process the jobs requested by the clients. Each worker is able to process one call of the service at a time, and for that it needs to access a shared database. The load balancer keeps a list of workers which are currently processing jobs and a list of workers which are available for new jobs, and distributes jobs among the workers. In Section 4, we will introduce an autoscaler. The autoscaler will increase or decrease the number of workers as needed. For this particular scenario, we will deploy the workers on the cloud, and each worker will have its own dedicated virtual machine. Since our concern is the deployment strategy for the hot pool, we will abstract from the deployment of the other parts of the system. In ABS any object which is not explicitly deployed on a deployment component, will run in an environment with unbounded available resources. Figure 1: An architecture for a service with a resource-aware hot pool of workers. In our example, the environment consists of clients calling the service. We are going to model two kind of clients: ClosedClient and OpenClient. Figure 2 contains the ABS model of these clients. The clients’ behavior is captured in the run method. The closed client does not flood the system. In each iteration this client waits for a cycle to pass, after that it sends an invocation of the service and waits for the result. The iteration will finish once the client has sent the desired number of jobs. The open client may flood the system. In each cycle this client sends an invocation without waiting for the result. If the cycle is very short, the system will receive a sudden burst of requests. Figure 2: An ABS model of closed and open clients. The former waits for a reply before it sends a new invocation, the latter sends a new invocation after a fixed period of time. Figure 3 suggests a workload scenario which is implemented in Figure 4 using the client behaviors described above. This workload creates 30 closed clients at time 50 and at time 150 and 80 open clients at time 100 and at time 200. Each client will send 10 requests, where each request has an average resource cost of 81, specified in the parameter taskCost. The closed client has a cycle of 5 time units while the open client has a cycle of one time unit, creating peaks of requests. We will use this workload to test the QoS and the accumulated billing cost of the different deployment scenarios for the system. 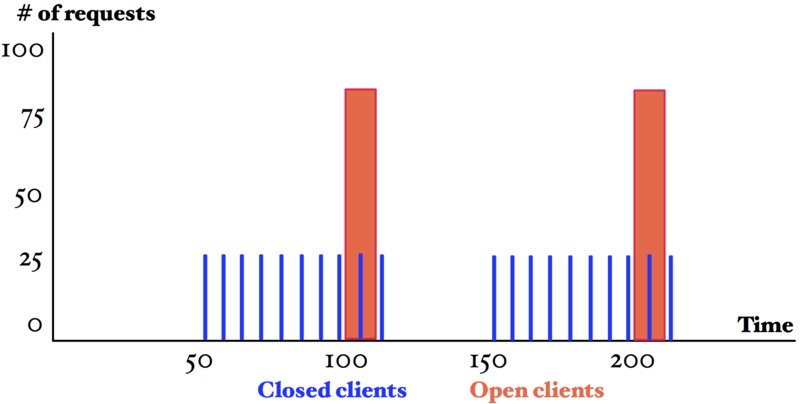 Figure 3: A workload pattern in terms of closed and open clients. Figure 4: Implementing the workload pattern in ABS. In this section we model an initial version of the service. In this case, the application manager consists of the load balancer and the service endpoint, where the load balancer is statically configured with a fixed number of workers. Figure 5 contains the ABS model of a worker which processes jobs. The worker is modeled by the class WorkerObject with two methods process and getDC. The implementation of method process abstracts from the functional behavior by adding a cost annotation, but captures the fact that the task needs a transaction to the database, it also takes into account the time needed to make this transaction. Note that this implementation can be refined with more explicit functionality and more fine-grained cost annotations. The rest of the method implementation checks whether or not the method call has kept its deadline. Since we want to check the QoS, we model hard deadlines instead of soft deadlines. The method getDC returns the identifier of the virtual machine where the worker is deployed, using the ABS keyword thisDC(). Figure 5: ABS model of the worker. Figure 6 contains part of the ABS model of a load balancer with a round robin scheduling policy. The RoundRobinLoadBalancer implements the interface LoadBalancer. This class keeps two lists, one with the identifiers of workers which are in use (or busy) and one with the identifiers of workers which are available. The class also has methods to add and remove workers to the lists, and to move workers from one list to the other. Method addWorker adds the identifiers of new workers to the list of available workers. In this version of the system, this method is called by the main block to configure a static deployment scenario with a fixed number of workers. Methods getWorker and releaseWorker move workers from the lists available to inuse and vice versa. These methods are called by the service endpoint to assign processing jobs to the workers. Method firingWorker permanently removes a worker from the list of available workers. Methods getNbrAvailableW and getNbrInuseW calculates the number of available workers and the number of workers that are in use, respectively. Note that we are not using the last three methods in this version of the system, they are used later in Section 4. Figure 6 also contains the ABS implementation of the service endpoint. This class has one method invokeService which is called by the clients and forwards the client request to one of the workers. Figure 6: ABS model of the load balancer and the service endpoint. Static Deployment. Figure 7 models the static deployment of the system as depicted by Figure 1 (without the autoscaler). In this case we create the database, the load balancer and the service endpoint, afterwards we deploy a fixed number of worker on the cloud. We also need to include the workload that the system will process (as described in Section 3.1). Figure 7: Static deployment of the service. In this section, we extend the model with an autoscaler to allow dynamic reconfiguration of the deployment on the cloud. Figure 8 models an autoscaler which increases and decreases the number of workers deployed on the cloud depending on the number of available workers. The run method models the initial deployment of workers. The method resize acts as a monitor which periodically checks if we need to adjust the number of workers. We use the following ad hoc policy: If the number of available workers is less than one quarter of the total number of workers, then we triple the number of available workers. If the number of available workers is greater than one third of the busy workers, then we reduce the number of available workers to half. Figure 8: ABS model of the autoscaler. Dynamic Deployment. Figure 9 models the initial deployment of the system as depicted in Figure 1. In this case we create the database, the load balancer, the autoscaler with an initial number of workers, and the service endpoint. We also need the workload, as described in Section 3.1. Figure 9: Dynamic deployment of the service. To assess possible deployments to meet this SLA, we compare four scenarios. For static deployment, we consider three scenarios by varying the number of workers, and hence the number of virtual machines, between 80, 100, and 120. The fourth scenario is a dynamic deployment with the autoscaler. We run each scenario 100 times using the ABS simulator. In each run we record the total number of workers and the number of busy workers which have been in use in each time interval. We also record the success rate of the invocations made by the clients (with a deadline of 10 time intervals) and the accumulated billing cost of running the scenarios until time 300.
for the different static and dynamic deployment scenarios. 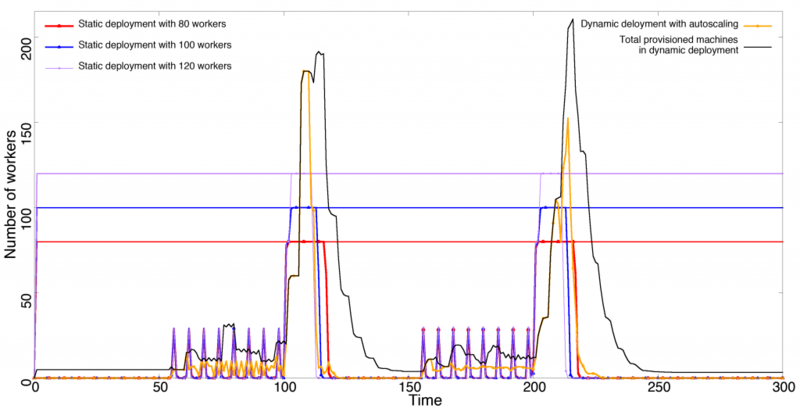 Figure 10 shows the number of provisioned machines (total number of workers) and the number of machines in use (workers in use) per time interval for each scenario, averaged over the 100 simulations. The red, blue, and purple lines in this figure capture the static deployment scenarios with 80, 100, and 120 workers, respectively. The straight vertical lines represent the statically fixed number of provisioned machines (virtual machines deployed on the cloud) in each time interval, while the oscillating lines capture the number of machines that are actually in use per time interval. In the case of the dynamic deployment scenario, the black and orange lines capture the varying number of provisioned machines and of machines in use per time interval, respectively. For the static deployment scenarios, we can observe over-provisioning of machines when the workload is low and congestion when the workload has peaks (see Figures 3 and 4 for the description of the workload). Note that the workload peaks occur when open clients are created, as indicated in Figure 3. For the scenarios with static deployment, the period of congestion is inversely proportional to the total number of workers: the higher the number of workers, the shorter the period of congestion. For the dynamic deployment scenario, the total number of machines and the number of machines in use varies according to the workload, and the duration of both periods with over-provisioning of machines and with congestion are significantly shorter than for the static scenarios. time 300 for the different static and dynamic deployment scenarios. Figure 11 compares the success rates (shown as the percentage of requests which have been executed within their deadline) and the accumulated billing costs for all scenarios until time 300, averaged over the 100 simulations. The success rate is scaled with the left y-axis while the cost is scaled with the right one. In the static deployment scenarios, the success rate improves as the total number of machines increases. In fact the third scenario with 120 machines was chosen because it has 100% success rate. For the dynamic deployment scenario, the average success rate, approximately 96%, is much better than for the static scenario with 80 machines (60% success rate), and is close to the static scenario with 100 machines (95% success rate) while it is a bit lower than the static scenario with 120 machines. When comparing the accumulated billing costs, the dynamic scenario is substantially lower than any of the static scenarios. In conclusion, the dynamic scenario offers the best trade-off between cost and quality of service which complies with the SLA described above. This paper revisits the main modeling concepts of ABS for modeling scalable and elastic services deployed on the cloud. We show by a simple example how different deployment decisions can be expressed and how these decisions affect the service-levels, formulated in terms of the success rate of service requests, and the accumulated billing cost for deploying the service, calculated from a pricing policy for the virtual machines. The accuracy of predictions made using ABS models has been demonstrated on Hadoop benchmarks  and on industrial case studies . We believe model-based decision making about deployment strategies enable higher quality and more cost-efficient services, both as part of the initial development process and as a tool for DevOps teams. Would you spend 3 minutes to answer 3 simple questions about this white paper? Elvira Albert, Frank S. de Boer, Reiner Hähnle, Einar Broch Johnsen, Rudolf Schlatte, Silvia Lizeth Tapia Tarifa & Peter Y. H. Wong (2014): Formal Modeling of Resource Management for Cloud Architectures: An Industrial Case Study using Real-Time ABS. Journal of Service-Oriented Computing and Applications 8(4), pp. 323–339, doi:10.1007/s11761-013-0148-0. Joakim Bjørk, Frank S. de Boer, Einar Broch Johnsen, Rudolf Schlatte & S. Lizeth Tapia Tarifa (2013): User-defined Schedulers for Real-Time Concurrent Objects. Innovations in Systems and Software Engineering 9(1), pp. 29–43, doi:10.1007/s11334-012-0184-5. B. W. Boehm & P. N. Papaccio (1988): Understanding and Controlling Software Costs. IEEE Trans. SW Eng. 14(10), pp. 1462–1477, doi:10.1109/32.6191. Frank S. de Boer, Dave Clarke & Einar Broch Johnsen (2007): A Complete Guide to the Future. In Rocco de Nicola, editor: Proc. 16th European Symposium on Programming (ESOP’07), LNCS 4421, Springer, pp. 316–330, doi:10.1007/978-3-540-71316-6_22. Christoph Fehling, Frank Leymann, Ralph Retter, Walter Schupeck & Peter Arbitter (2014): Cloud Computing Patterns: Fundamentals to Design, Build, and Manage Cloud Applications. Springer, doi:10.1007/978-3-7091-1568-8. Reiner Hähnle (2013): The Abstract Behavioral Specification Language: A Tutorial Introduction. In: Formal Methods for Components and Objects, LNCS 7866, Springer, pp. 1–37, doi:10.1007/978-3-642-40615-7_1. Reiner Hahnle, Michiel Helvensteijn, Einar Broch Johnsen, Michael Lienhardt, Davide Sangiorgi, Ina Schaefer & Peter Y. H. Wong (2013): HATS Abstract Behavioral Specification: The Architectural View. In Bernhard Beckert, Ferruccio Damiani, Frank S. de Boer & MarcelloM. Bonsangue, editors: Formal Methods for Components and Objects, LNCS 7542, Springer, pp. 109–132, doi:10.1007/978-3-642-35887-6_6. Reiner Hähnle & Einar Broch Johnsen (2015): Designing Resource-Aware Cloud Applications. IEEE Computer 48(6), pp. 72–75, doi:10.1109/MC.2015.172. Einar Broch Johnsen, Reiner Hähnle, Jan Schäfer, Rudolf Schlatte & Martin Steffen (2011): ABS: A Core Language for Abstract Behavioral Specification. In Bernhard Aichernig, Frank S. de Boer & Marcello M. Bonsangue, editors: Proc. 9th International Symposium on Formal Methods for Components and Objects (FMCO 2010), LNCS 6957, Springer, pp. 142–164, doi:10.1007/978-3-642-25271-6_8. Einar Broch Johnsen & Olaf Owe (2007): An Asynchronous Communication Model for Distributed Concurrent Objects. Software and Systems Modeling 6(1), pp. 35–58, doi:10.1007/s10270-006-0011-2. Einar Broch Johnsen, Rudolf Schlatte & S. Lizeth Tapia Tarifa (2012): Modeling Resource-Aware Virtualized Applications for the Cloud in Real-Time ABS. In Toshiaki Aoki & Kenji Tagushi, editors: Proceedings of the 14th International Conference on Formal Engineering Methods (ICFEM’12), LNCS 7635, Springer, pp. 71–86, doi:10.1007/978-3-642-34281-3_8. Einar Broch Johnsen, Rudolf Schlatte & S. Lizeth Tapia Tarifa (2015): Integrating deployment architectures and resource consumption in timed object-oriented models. Journal of Logical and Algebraic Methods in Programming 84(1), pp. 67–91, doi:10.1016/j.jlamp.2014.07.001. Kim Guldstrand Larsen, Paul Pettersson & Wang Yi (1997): UPPAAL in a Nutshell. International Journal on Software Tools for Technology Transfer 1(1–2), pp. 134–152, doi:10.1007/s100090050010. Jia-Chun Lin, Ingrid Chieh Yu, Einar Broch Johnsen & Ming-Chang Lee (2016): ABS-YARN: A Formal Framework for Modeling Hadoop YARN Clusters. In Perdita Stevens & Andrzej Wasowski, editors: 19th International Conference on Fundamental Approaches to Software Engineering (FASE 2016), LNCS 9633, Springer, pp. 49–65, doi:10.1007/978-3-662-49665-7_4. Jan Schäfer & Arnd Poetzsch-Heffter (2010): JCoBox: Generalizing Active Objects to Concurrent Components. In: European Conference on Object-Oriented Programming (ECOOP 2010), LNCS 6183, Springer, pp. 275–299, doi:10.1007/978-3-642-14107-2_13.